Positive Impact Waste Solutions manufactures its PIWS-3000 large unit as either a mobile unit or a fixed-site unit. Both units use the same patented two chamber grinding technology that process over 2,000 lbs per hour or over 8.0 million lbs of waste per year. 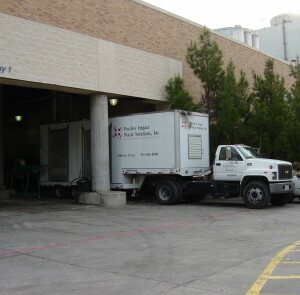 PIWS’s EPA-approved dry chemical, Cold-Ster® is used to disinfect the waste. The PIWS-3000 Mobile/Fixed has an on-board computer interface that monitors the entire process. The feed hopper captures the net weight of each load and the computer identifies all pertinent information. The proper amount of Cold-Ster® is added to the waste to be processed and is mixed while the waste is ground in the two stage grinding process (See the PIWS-3000 Technology page for additional information). 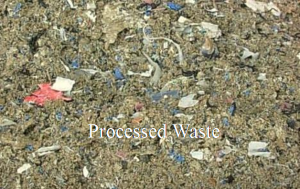 The regulated medical waste is ground and mixed throughout the process and the processed material is augered out of the system into a general trash receptacle. 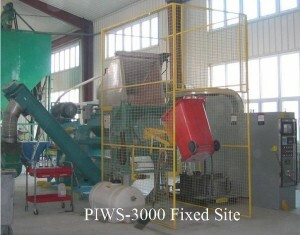 The processing of the PIWS-3000 unit reduces the original volume of the material by over 70% and renders the waste unuseable and unrecognizable. The treated material is augered over a pH probe that continously monitors the processed waste for the regulatory required pH.